At Maatouks, we are dedicated to ensuring our clients are treated with courtesy and respect. We endeavour to provide our clients with a full range of legal options so that they may remain in control of any legal proceeding they may wish to pursue. Peter entered the legal industry in 1993. He commenced his employment with a medium sized firm, which at that time, was based in Parramatta. During the course of his employment, Peter was transferred to the firm’s Sydney office, where he worked consistently for five steady years. This provided Peter with an abundance of valuable experience and a solid platform from which to launch his career in the legal sector. However, being based in the Sydney office, Peter felt that he was not reaching the people in the community who really needed his help. As a result, Peter decided to leave the fast and busy lifestyle of Sydney to commence work in his local community in Sydney’s west. Before long, Peter opened two of his own offices; one in Liverpool and one in Parramatta. Peter has worked in Campbelltown, Narellan and Picton. He has generously devoted his time and efforts to a diverse range of charities including,the Spastic Centre, women’s refuge centres, immigration centres and local schools. At the heart of Peter’s success is his capacity to understand the individual needs of his clients. It is his promise that he will be there by your side at your time of need to support you and to fight for all of your rights. Peter does not know the meaning of the words ‘give up’. Peter will fight for you to the very end. Peter demonstrated his ‘never give up’ attitude on the very first day that the doors of his firm, Maatouks Law Group, were opened; even on this day of celebration, Peter filed documents for a client seeking leave to commence proceedings in the High Court of Australia. For lawyers in Liverpool get in touch today. No solicitor or Law Group can guarantee any outcome. 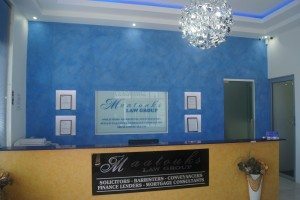 But at Maatouks Law Group Peter and his team of Liverpool lawyers are dedicated to achieving superior results for their clients. Peter and his team are motivated by quiet confidence as they have the resources of the best Queen’s Counsels, Senior Counsels, Barristers and Solicitors in Sydney. 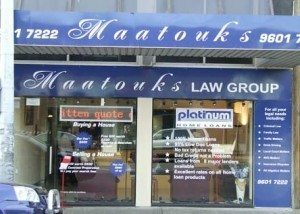 So no matter what your legal requirements might be, Maatouks Law Group has the experience, confidence and resources to provide you with a level of detailed service and commitment that is second-to-none. Expert lawyer Liverpool that helps the community. Peter an Inspiration to All Businessmen ‘The Business Person of the Year Award has captured the imagination of entrepreneurs and the business community across Liverpool. 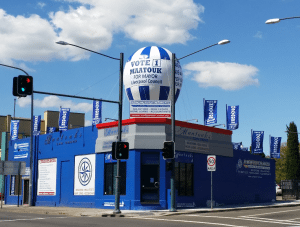 The Liverpool Leader received many entries in this popular category which resulted in 20 finalists ranging from butchers to florists, hair dressers and real estate agents. One of the finalists is 27-year-old Peter Maatouk who last year set up his own law firm called Maatouks Law Group in Liverpool. [Raised] in Bringelly, Mr Maatouk was the youngest sole practitioner in NSW who now employs two solicitors and a conveyancer. Surprisingly, he also has time to run two other businesses; a home loan / finance company and an exporting outfit which together employ seven staff. Mr. Maatouk is the first in his family to venture into law and said he owed his success to his supportive parents. “Without them we would not have got this far,”. He has proven to be more than just a lawyer in Liverpool. Source: Liverpool Leader, “Peter an Inspiration to All Businessmen”, Wednesday 27 August 2003, p.66.